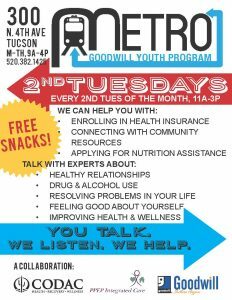 Learn more about our Goodwill events and community outreach programs. You can find us at job fairs, workshops, home shows, sustainability fairs, & more. March 30, 2019 – Prom-O-Rama Saturday 10am – 3pm Goodwill is partnering with Cinderella’s Closet again this year to make prom not special for anyone that wants it to be. We will be giving out free accessories, jewelry and shoes while Cinderella’s Closet will be providing the dresses and suits. We will be at the Jewish Community Center again this year. April 12-14, 2019 – SAHBA SPRING SHOW Our Youth Restoration Project will be showing off and selling their best restored, refinished and re-imagined furniture, decor, bbqs, and bikes. April 7th, 2019 – Spring Cyclovia Tucson We will be out at Cyclovia again this year with a booth at the Corbett Porch Activity hub on 6th Ave just west of our 4th Ave store. We will be helping riders decorate their bikes with streamers, flowers, playing cards for their spokes and more. 20% Off Teacher Discount Every Thursday and Friday! 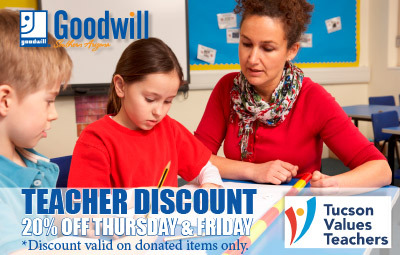 Present your Tucson Values Teacher card to the cashier to claim your discount. 20% Off Hero Discount Every Sunday and Monday! 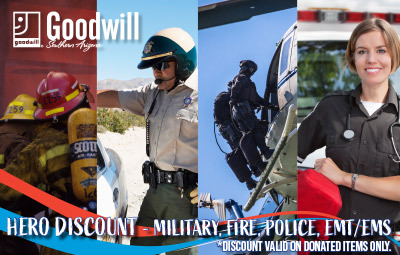 Military, Police, Fire, EMT/EMS present a badge or ID card to claim your discount. *Discounts valid on donated items only. Outlet stores excluded. March 2-3, 2019 – Tucson Festival of Books 9:30am – 5:30pm Come stop by our booth on the UofA mall and check out our wide range of books, fiction, non fiction, comic books, posters and more. Booth # to come. Now until November 5th – 2018 Halloween Costume Contest Tag us on Facebook or Instagram for the chance to win! October 5-7, 2018 – SAHBA FALL HOME SHOW Our Youth Restoration Project will be out showcasing and selling their best work at the SAHBA Fall Home Show at the TCC. October 20th, 2018 – 50% Off Sale Discount on all donated items at our GoodThreads Boutique and Goodwill Thrift Stores. Outlets excluded. September 21, 2018 – Fall Health Extravaganza 8am – 11am Armory Park 222 S 5th Ave. Join us for a day of wellness and fun! 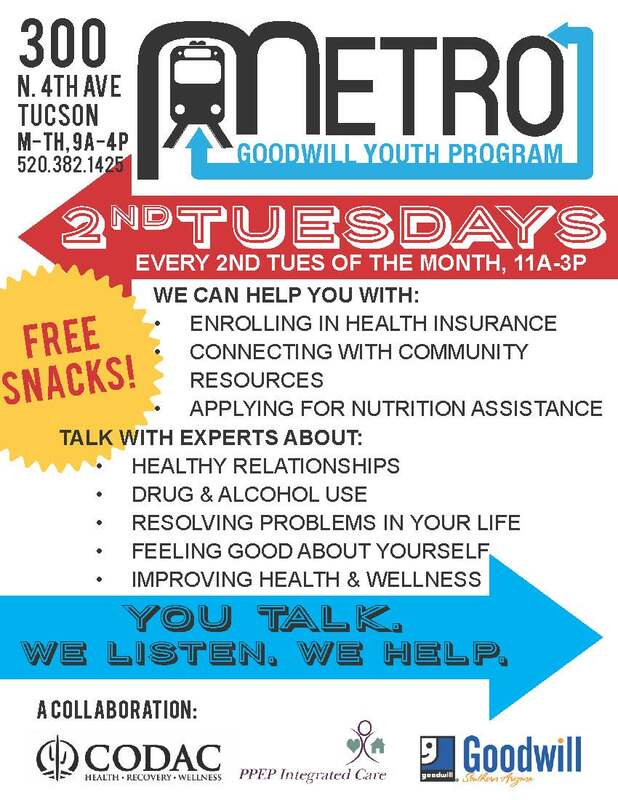 There will be refreshments, entertainment, health & wellness resources, haircuts, and so much more. ALL FREE! 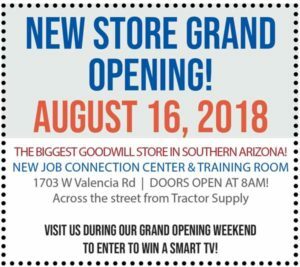 August 16th, 2018 – Midvale Store Grand Opening 1703 W. Valencia Rd. Ribbon Cutting at 7:50am, doors open at 8am. March, 10th – 11th, 2018 – Tucson Festival of Books. Find us at Booth #110 on the west end of the UofA Mall. Now until – October 31st 2017 – Nightfall Discount Coupons Available at all Goodwill stores and donation centers. Tuesday, October 17th 2017 – DREAM Job Fair at the TCC. Saturday, October 14th 2017 – 50% Off Sale on all donated items at all of our Retail Thrift Stores and the GoodThreads Boutique. Outlets excluded.